Due to their aggressive overseas expansion efforts, Chinese manufacturers of solar products in the recent years have raised their market shares in many countries worldwide. Even the relatively closed market of Japan has seen a gradual increase in imported PV modules from China. 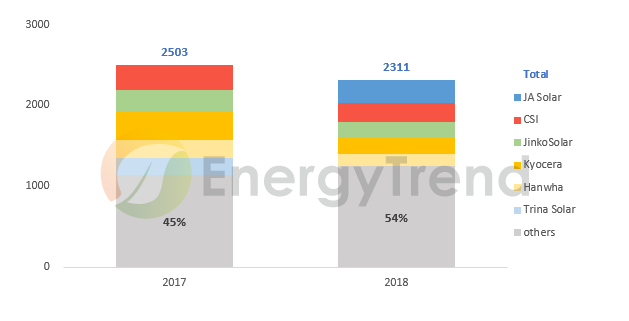 The latest customs data analysis by EnergyTrend finds that China-made modules exported to Japan totaled 2,311MW in 1H18, representing a 10% increase in the penetration rate compared with 1H17. Also, JA Solar was the shipment leader among module suppliers that send China-made products to Japan in 1H18, accounting for 274MW of the half-year total. A comparison of EnergyTrend’s customs data for 1H17 and 1H18 finds that shipments of China-made modules to Japan in 1H17 totaled 2,503MW. Also, Kyocera’s Chinese subsidiary was the shipment leader during that period. However, Kyocera’s subsidiary was knocked down to fourth place in the ranking for 1H18 as JA Solar climbed to first place. According to data from Japan Photovoltaic Energy Association (JPEA), module shipments in Japan for the half-year period totaled 3,132MW in 1H17 and 2,592MW in 1H18. Although the total shipments fell year on year, the market share of China-made products actually rose visibly. Compared with other regional solar markets, Japan expects higher standards in product quality and is less receptive to foreign products. The gradual increase in the market share of China-made modules indicates a recognition of major Chinese manufacturers’ ability to achieve those quality standards. Furthermore, the Japanese solar market is highly competitive, as the market shares are not concentrated among few companies. In 1H17, 55% of all China-made module exports to Japan came from top five suppliers. That share figure dropped to 46% in 1H18, hence showing a significant rise in the level of competition from last year. From the angle of product specifications, modules that are under 300W in output continue to make up the majority of the shipments from China to Japan. Around 20% of the total shipments of China-made modules for 1H18 belonged to the 270W category. 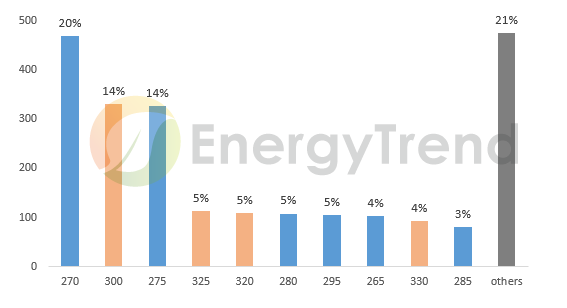 Although conventional multi-Si products in the range of 270-275W are still the mainstream in Japan’s PV module market, there is growing adoption of high-efficiency mono-Si products with outputs of 300W and above. The share of products featuring 300W or higher in the total shipments of China-made modules to Japan during 1H18 was the second largest at 14%, thus suggesting a shift in market demand has been taking place. Nevertheless, demand in Japan’s module market is still widely disperse across different types of products. For instance, the share of the top 10 products in the total module shipments from China during 1H18 came to just 79%. As the leader of China-made module exports to Japan in 1H18, JA Solar has enjoyed steady shipment growth that has become more noticeable since March. The company’s cumulative shipments to Japan also reached 3.3GW by the end of 2Q18.While JA Solar has been focusing on breaking into the Japanese market in the recent years, the company does not rely on that country alone for exports. Total shipments of PV modules from JA Solar to markets outside China reached 4GW for the entire 1H18.